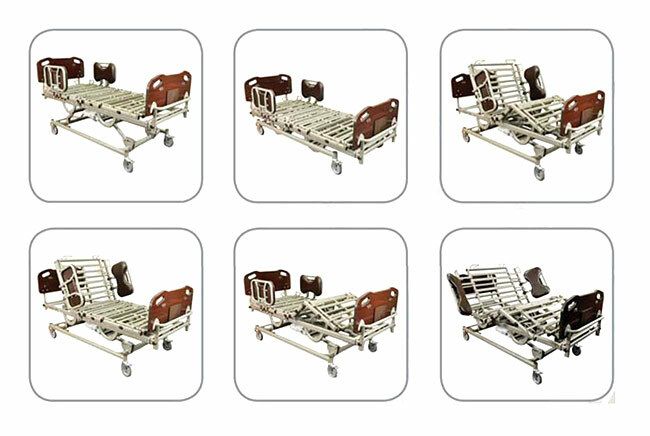 Versatile multi-function bed the Baribed 750 Prime can be used for a wide range of patients up to a high capacity 7501b limit. The bed is capable of expanding to accept a 48" mattress making it an excellent choice without having to step up to a full bariatric platform. 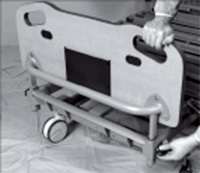 'Features include a push button expandable deck, premium head and foot boards with grab bar, and three position padded assist rails. 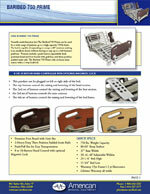 The Baribed 750 Prime rolls on heavy duty casters with a 2-way lock/roll. This pendant can be plugged on left or right side of the bed. The top buttons control the raising and lowering of the head section. The 2nd set of buttons control the raising and lovering of the foot section. the 3rd set of buttons controls the auto contour. 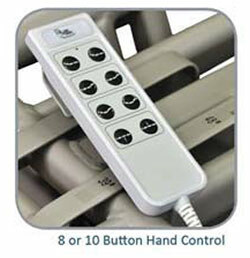 The 4th set of buttons control the raising and lowering of the bed frame. All mattress guards are shipped upside down and on reversed sides for shipping purposes. These will need to be correctly placed along the bed to ensure proper function. Carefully slide out front and rear mattress guards and reinsert on opposite sides facing the guards in an upright position. Depress the center release button and slide the rail completely out. Re-insert right side up on opposite side as shown. See below for proper placement. 1. Using a Phillips Screwdriver, bolt the head and foot board to the mounting brackets. 2. Unscrew knobs on each side of support assembly at both ends of the bed frame. 3. Place the mounting brackets of the headboard/footboard into the slots of the support assembly. NOTE: The mounting bracket on the foot board should have the push/pull bar facing away from the bed. 4. Slide headboard/footboard down until it stops. Screw the knobs back in on each side of the support assembly to lock the headboard/footboard into position. Remove the protection paper that is around the side rails by removing the (4) bolts on the back of the side rails using 5/32” hex key. Remove the paper and place the bolts back onto the side rails. Do this for both side rails. The side rails are now ready to be assembled on the bed frame. 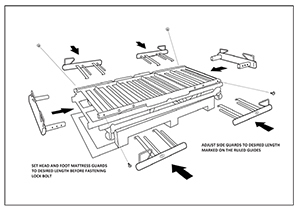 Locate side rail retainer on each side of the bed frame. NOTE: Use this as a guide to place side rails in correct spot. Place side rail on side of bed with one end into the side rail retainer. The holes on the bracket of the side rail should fall below mattress deck. 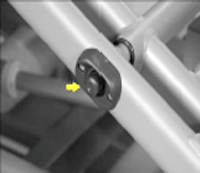 Slide a washer onto a ½” bolt and insert the bolt as shown. Use a ¾” Wrench and Socket to tighten the bolt. Repeat the previous step for the remaining bolts for the side rails. NOTE: It is normal to have some play in the side rail. Choose which width the bed needs to be extended to. This width extension expands by using the push button mechanism. If the extension is pulled out to the first sticker on the slat it will read 39”. If the extension is pulled out to the second sticker on the slat it will read 42”. If the extension slats are pulled all the way out they are at 48” wide. Push the expansion button mechanism in and pull out extension until you reach what width the bed frame needs to be set at. 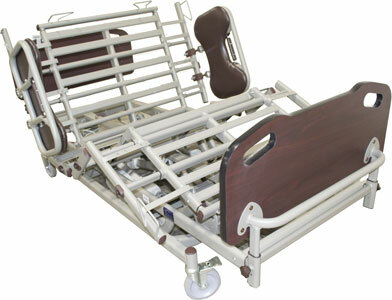 Overall Length ( w/head and foot boards) 97"
Width Expansion 39"- 42"- 48"
Length of Mattress Deck 80"- 84"
Mattress Deck Height (low) 15 3/4"
Mattress Deck Height (high) 29 1/4"
****This includes the weight of the resident/patient and all other accessories including but not limited to mattress, head/foot boards, assist bars, etc .